CLICK ON THE LINKS BELOW TO READ MORE ABOUT MISS AFRICA USA PAGEANT QUEENS AND DELEGATES AT WORK, SERVING THEIR COMMUNITIES. Her Love for children and desire to help orphans in her homeland Liberia, meant Queen Teizue would spare no second when the opportunity to do exactly what she wanted to do came up. 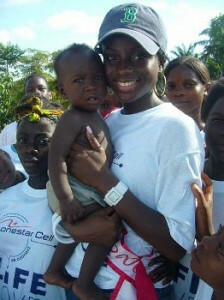 A trip to Liberia to help orphans in orphanages was a fulfilling experience for Queen Teizue. Miss Africa USA 2007- 2007 Visits Liberia to Promote Education, distributes school Supplies in various Schools.